I am pleased to share that this week I turned in my petitions and am now an official candidate for mayor of Chandler. As an official candidate, I want to thank everyone who signed the petition supporting my candidacy for this race and I look forward to continuing to serve our great city. In the coming months, I look forward to continuing to connect with voters and share my goals for this role. I am passionate about our community and look forward to representing my fellow Chandler residents as your next mayor. I want to say thank you to everyone that signed my petition. Now it is official, as of today, I am your mayoral candidate for Chandler 2018!! To my opponent, Martin Sepulveda, it’s time to debate! You need to file your paperwork and become an official candidate to make this happen. I have told you for months that we will meet and discuss issues related to Chandler. Now is that time. I look forward to discussing Council track records related to serving Chandler, your math claims, and false accusations. Turn in your paperwork and let’s set up a public and publicized forum with the Chandler Chamber. I and the voters of Chandler are waiting on you. To all who read this, encourage Martin Sepulveda to turn in his signatures NOW and officially become a candidate. This week we celebrated the expansion of the Santan Vista Water Treatment Plant in partnership with the Town of Gilbert. This water plant will provide clean water for both Chandler and Gilbert and through this partnership, the taxpayers of Chandler will save over $30 million in the cost of completing the plant expansion. The current unemployment in Chandler is 3.8% which is the lowest rate since the year 2000. This underscores the continued economic growth the city has been enjoying. A recent report on the ASU School of Engineering shows this is now the largest engineering program in the US and that over 75% of graduates stay in state after they complete their program. This is another great asset to the continued development of Chandler’s economic growth. I also had an opportunity to be involved with some great causes this week. Relay for Life, an event the raises funds for the American Cancer Society was held on Friday. My wife, Lynne Hartke, was an attendee of the event in 2009 and has served in a leadership role with the annual event since 2010. I am privileged to also be involved with the event and supporting fundraising efforts for an excellent cause and collaborating with groups from all over Chandler. This week, I was able to raise over $1,200 for the Chandler Police Department Team by participating in their “Jail and Bail” event. Doing my time was well worth it for this cause! As April comes to a close, I am excited to wrap up another exciting week in Chandler, Arizona. On April 27th I attended an all-day budget session to work on the next budget for our city. Chandler’s future is bright as the city continues to grow and thrive. This year’s budget has been constructed conservatively and enjoys a triple-A bond rating from all three rating agencies. All three public safety unions have signed off on two-year contracts. While the city faces an underfunded public safety liability that was inherited by bad speculation from the state pension board, we continue to pay it down. This 2018/2019 budget adds $9.9 million in one-time money to do this. Every city is facing the same issue, but we have chosen to pay it down rapidly rather than kick the can down the road for future residents to be saddled with it. I am also happy to report that overall crime rates have decreased in Chandler over the last year by 3.8 %. The last years have also been exceptionally low making this decrease all the more exceptional. In other Chandler developments this week, I was able to attend the groundbreaking ceremony for Orbital ATK’s new 47-acre facility here in Chandler. Orbital ATK is a leading aerospace and defense company and they are expanding their operations in Chandler. Once completed, Orbital ATK will provide over 2,000 jobs in Chandler. I am excited to see their presence grow in Chandler and for the opportunities, this provides to our city. More information about this development can be found here. This past week I and For Our City Chandler leaders met to prepare for the impact that the teacher’s walkout would have on families and children in our community. Volunteers came together to prepare snack packs for children and to provide other services to support children who would normally been in school this week. It is a privilege to be able to work with groups such as this to provide a tangible help to our communities. If you are looking for a way to get involved in supporting our community and enjoy collaborating with great people, I highly recommend For Our City Chandler. More information can be found here. We are blessed in Chandler to have such great leaders and compassionate and concerned volunteers. Thank you!! Momentum continues to build in my campaign to be Chandler’s next Mayor. This week I was joined by several of my colleagues and many supporters at Alamo Draft House for a Meet and Greet event. I was able to speak with many individual supporters, meet with several groups interested in my campaign and speak before large groups of several hundred. I enjoy these events because it gives me an opportunity to meet so many members of our community and ensure them that I hear their voice and am supporting and representing the needs of our community. I would love to meet you at my next event, at a coffee place or with a group at your house. Please check my facebook page and events page to see when the next event is available. Meet and Greet at Alamo Drafthouse Phoenix with, Terry Roe For Chandler, Rene Lopez for Chandler City Council, Matt Eberle for Chandler City Council, Nora Ellen, Jeremy Robert Bain McClymonds, Thank you everyone we had an awesome time. This has been a productive and busy week. I have spoken at a Veterans group, at our Chamber Leadership Day, Neighbors Who Care, a large retirement group in south-east Chandler and at Si Se Puede’s annual banquet. I have attended our Chamber’s Business after Business event, our Historical Society’s luncheon, a County Agriculture breakfast, directed a community food box giveaway, and spoke with dozens of individuals who have joined and supported my campaign to become Chandler’s next mayor. Next week we have a Meet and Greet (please see additional details below), an all-day budget session, Council meetings and more opportunities to tell our story about Chandler’s future. An awesome time with Lynne Hartke, Terry Roe, Rene Lopez for Chandler City Council, Terry Roe For Chandler,J.D. Mesnard, Nora Ellen, Sam Szeto, Farhana Shifa for Arizona, Raphael Ahmed, Paul Ramirez, Lee Huff, and many more thank you for your support. One of the greatest privileges of serving in Chandler is the incredible communities and individuals that I am able to interact, work, collaborate and represent in my current role as City Councilman and in my future role as Mayor of Chandler. This week I was privileged to have the support of many members of our community at a Meet and Greet event hosted by members of Chandler’s Asian Community. The event was held on 4/14 at the C-Fu Gourmet Restaurant in Chandler. Additionally, I was honored to have multiple leaders present to show their support, including my friend, Sam Szeto; Speaker of the Arizona State House of Representatives, JD Mesnard; Lee Huff, Director of Veteran Services in Congressman Andy Biggs’ office; Chandler Vice Mayor, Nora Ellen; Chandler Councilman, Terry Roe; Chandler Councilman, Rene Lopez; Chandler Councilman, Sam Huang; and State Representative candidate, Farhana Shifa. Speaking at last night’s Meet & Greet! Having the support of these leaders and the members of the community behind them encourages and inspires how I approach my work in our city. Please join me and Chandler City Councilman Rene Lopez for a Meet and Greet event next Wednesday, April 25th from 5:30-7:00 PM at Alamo Drafthouse in Chandler. This is an excellent time to come and hear more about our vision for Chandler and how you can be involved in the future of our city. Additionally, there will be another Meet and Greet event on May 12th at the Forum with Revelation Realty at 6:00 PM, please join us. This has been a productive and exciting week in Chandler. I would like to take this opportunity to share some of the administrative processes that I am involved in within our city government as well as some of the excellent events that I have been able to participate in happening throughout the week. Continue to check back for further updates about Chandler’s goings on. With my role as your Council member, we are in the midst of planning Chandler’s 2018/2019 budget. Our goal is to continue to treat our employees well, not raise property tax rates, develop more multi-use fields for recreation and other amenities, continue on our 11 year plan to aggressively pay down Chandler’s unfunded liability on Police and Fire pensions (we did not create the unfunded liability, but we have to pay it), remain structurally balanced and make sure that Chandler remains the best place in the valley to live, work and play. Last Saturday, April 7th, I was able to attend Chandler’s 19th annual Jazz Festival, hosted in Downtown Chandler. 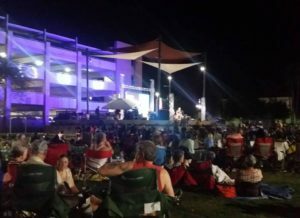 This free event was a great opportunity to hear smooth Jazz groups, including the Bad News Blues Band and the Francine Reed-Lewis Nash All Star Band. Also, this festival offered an opportunity for people to enjoy the many excellent shops and restaurants in the downtown area. If you haven’t visited the downtown area recently, I recommend that you come check out the local offerings on your next night out. On Tuesday, April 10th, the United Food Bank invited me to attend their 8th annual Friends Breakfast. The United Food Bank Friends Breakfast celebrates the incredible work and support provided by individuals and businesses in the area toward the vital work that the food bank provides. 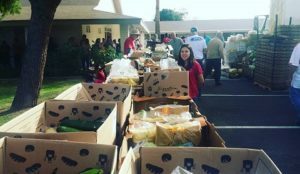 Through their support, the food bank provides 65,000 meals every day to those in need. It was a privilege to be part of this celebration and I was joined by multiple members of the Chandler City Government at this event. After several weeks of fierce and fun competition, Chandler has claimed its title as champion of the 2018 Battle of the Burbs competition. The competition, hosted by Mix 96.9 FM, seeks to find the most dedicated and engaged “burb” around and it’s no surprise that Chandler won out among the many great competitors. The prize for this victory was a free concert featuring Mat Kearney and his full band in downtown Chandler on Friday, April 13th. It was exciting to see how engaged the community was in this event and how our residents take pride in their city.